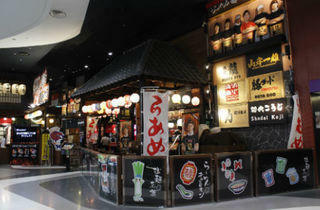 Bringing the Ramen Champion noodle competitions held annually in Japanese cities to a Singaporean audience, this sprawling Bugis+ flagship of the concept features six local outposts of some of Japan’s best ramen-yas, battling to win the hearts and tastebuds of ramen crazy Singapore. 2013’s champion, Buta God – as decided by the public’s vote last year – reigns here with thin noodles and sliced and pan-fried pork belly slices coated in a slightly sweet tonkotsu broth. Mendokoro Aoi, with the red bowls, serves thin noodles in a pork bone soup with a modest topping of chilli paste which is said to be a hit with the ladies. Fellow 2013 entrant Menban Yamagishi Kazuo is noted for its tsukumen (cold noodle), whom its eponymous founder, Yamagishi, is said to be the founder of in Japan. 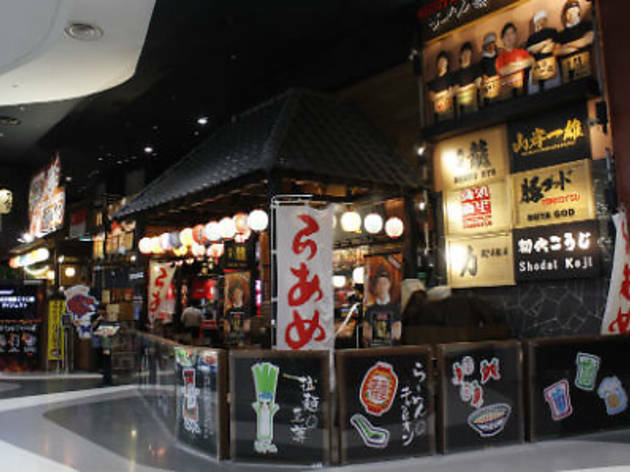 New additions to this year’s pool of contenders include Shodai Koji, Menya Ryu and Riki Power Ramen (who made its debut locally at Ramen Champion’s Changi Airport outlet). The former features an abundance of choice as far as ramens go: pick from two soup bases – chicken, or chicken and pork – to accompany a thin or medium noodle, and meats like chicken thigh, pork belly and pork collar for protein, or opt for a healthier option which stirs a spinach paste into the bowl. Menya Ryu’s milder Sapporo-style ramen includes three misos pastes – kara, white and a smaller portion of premium hatcho – in its chicken and tonkotsu-based soup. Riki Power satisfies iron palates with a garlic-rich, darker hued, creamy tonkotsu broth and thicker cut, chewy noodles and a generous heap of bean sprouts in its signature Special Power Ramen ($16.50). Voting for Ramen Champion's 2014-2015 season ends 30 June 2015. Pick up a ballot and give your favourite ramen-ya a tick if you want more of their noodles to slurp on – the winning restaurant will be invited to set up a restaurant here in Singapore in late 2015.